The bells have been peeling a new tune for insurers and 2019 is shaping up to be the year insurers begin playing from the new songbook. The sound is a call to compete in the experience-driven digital economy, with its new and evolving B2B and B2C ecosystems. 2019 is the inflection point where many will make the fundamental technology pivot toward supporting new platform-based business models. The pivot will reach prospective customers with updated products leveraging new InsurTech, partners and data while building engagement with existing customers. Let’s look at eight essential next-generation platform elements you should be bringing on board for 2019 and beyond. Enable designing and delivering exceptional digital experiences. Design for the cloud (think cloud-native!). Optimize the new world of data analytics and AI. For easier reading, we will cover the first four topics in this part 1 blog, and the remainder in a following part 2 blog. Continuing to differentiate on price is an unsustainable race to the bottom in the digital economy. 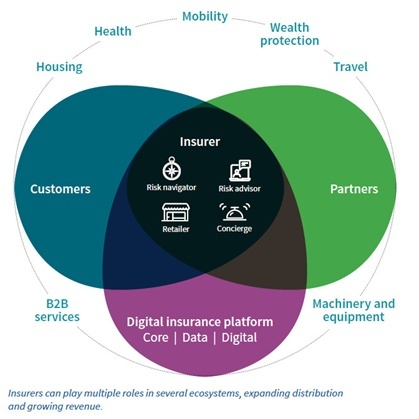 In an experience-driven market, the imperative is differentiating on service and experiences using a modern insurance platform that is capable of connecting to ecosystems that are emerging as the new commerce building blocks. As McKinsey puts it, businesses will become more and more interdependent within and across categories, eclipsing traditional industry boundaries. Replacing them will be a set of massive, distinctive B2C and B2B ecosystems clustered around fundamental human and organizational needs. What’s more, the firm predicts 12 major ecosystems will account for $60 trillion in revenues – or roughly 30% of all global revenue – by 2025. To stay competitive, insurers must break into the emerging ecosystem economy by rethinking their traditional roles and then developing new value-added services to generate new revenue streams. A digital insurance platform is central to this mandate. Getting the right experience for the right user at the right time requires embracing customer-centric design. For example, when a customer uses a smart speaker to start searching for a home in another city, an insurer can automatically reach out – based on information in the individual’s data record – to offer relevant coverage quotes. Such customer-centric interactions necessitate adopting a framework capable of serving up advanced digital experiences. In the home search scenario, an application programming interface (API) gateway can provide integrations between an insurer’s core systems and third-party sources to help create and deliver the coverage quote. More broadly, persona-based design capabilities in the framework enable producing any number of web and mobile apps, or micro-apps, for everything from agent administration to self-service claims. In addition, combining the framework with a modern cloud provider nets you cloud-based AI for building myriad customer-centric capabilities, like chatbots or other types of natural language interactivity. As consumer expectations accelerate, insurers must innovate their products and offerings rapidly. Doing so requires the delivery and experience models developed by Netflix, Amazon, Uber and others. This includes using an appropriate digital transformation platform and a DevOps IT approach that enables quickly extending the platform and delivering services to meet evolving demands. A mature and robust DevOps approach empowers you to adopt a continuous integration and continuous delivery (CI/CD) model. Unlike the traditional “big bang” approach, CI/CD results in shorter release cycles, for faster innovation and reduced risk, with higher quality code, because development teams test frequently and iterate continuously. Attempting to adapt legacy applications, which run on mainframes or more updated enterprise application platforms, for the cloud only creates suboptimal legacy systems in the cloud. They are not able to take advantage of all the benefits offered by the cloud.. Instead, insurers need modern enterprise applications with cloud-native architectures, using a variety of cloud-native technologies such as microservices, containers and APIs. The result is a modular, interconnected and agile system of digital capabilities, which enables IT departments to create, reconfigure or replace components as needed. This approach permits fine-tuning systems, rather than performing forklift upgrades, because only the relevant component is updated or replaced. Read more in Part 2 of this blog.